I am sorry that it has taken me so long to write, but we have been enduring the most ghastly winter. It is the cold Sam, an unceasing and insidious cold which has already cost us Crickson and Smart who went Blighty One with terrible frostbite. On top of that we have no pens and so I am writing this to you using Crickson's finger which he gave me before he left. All in all, I must say that the last 9 days have been quite bleak old thing. Yet still they make us run. Slated to go for a 7 mile tempo run round ▒▒▒▒▒▒e. 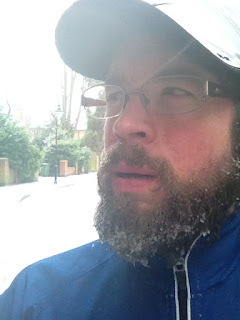 Set out in to a fresh winter morning at 07:30 but the weather rapidly deteriorated and by the time I had finished, I was running through two inches of snow. Thought it was actually quite jolly. What a fool I was. Snow has gotten worse. Most of our supply lines have been cut off and people are panic buying in Waitrose like they do on Christmas Eve. I looked in the log and saw 17 miles next to my name yet through the despair I could feel my upper lip annealing as I pulled on my shoes - this is how we conquered half the globe Sam. Two times round the b▒▒▒▒▒▒▒▒▒▒▒▒n, and running on icy sand, but I did it; by the grace of Chaka Khan I did it. I can hardly write today Sam. The reduction in traction has taken its toll. I have just got back from 6 miles of 1km intervals and it was simply horrid. Ice still there, snow still there and Sunday's sly 17 had taken a bigger chunk from me than I thought. 500m in to the first interval I noticed something was awry when I found that I could not make my legs go fast enough. Sure enough, some b▒▒▒▒▒▒ had replaced them with bully beef. As I completed the second interval, I realised that my bully beef was slowly turning to Jell-O. Just as I could not see how I was going to get though another step, let alone two more repeats, my iPhone stopped working like the capricious little s▒▒▒ it is and so I was left on my own in no man's land with no Def Leppard. But I could not fail Sam: I set my face in to a primeval grimace of furious spleen and set off on the third repeat on the ice like Bambi with rabies. As I descended in to a berserk madness, I forged myself onward with the old regiment's marching song 'F▒▒▒ ▒▒▒ you ▒▒▒▒▒▒g ▒▒▒▒' which was spat with venom at trees, lamposts, bus stops and accidentally one slightly aghast woman round a corner. There are always casualties in war Sam. After completing the last interval on screaming Jell-O sticks, I returned with mission accomplished, but I had paid my dues, been through the wringer and its memory will long be with me. 6 miles, very little snow, still having flashbacks from Wednesday. Woke to rain. There was no snow and no ice but there was rain with a brisk and gusting wind. But then, like a spell breaking, the clouds rolled away to reveal a most beautiful blue, English sky and I knew that it was today that I was going over the top, Sam. 3 miles over the top to be precise. The first 17 miles were fine, but in mile 18 and after 3 years apart, I once again came face to face with Herr Doktor von Marathon when Mr. Glycogen checked his cupboards and found that he had mistakenly wandered in to Mrs. Hubbard's and she was still panic buying in Waitrose. My Central Nervous System had run a stock check, found that someone had clumsily left the tap on and that the Carb tank was nearly empty necessitating an enforced shut down of all non-essential activity. But I pushed on and through, although I felt none too damn clever for the next two days I can tell you. This is a long race Sam but one we must run so chin chin and remember to pour some sugar on me old thing. ONWARDS! For King and Country and Emily!